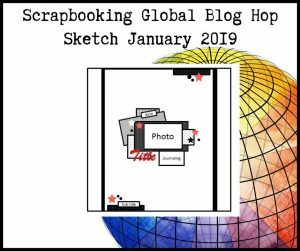 Welcome, today I am taking part in the Scrapbooking Global Blog Hop. This month our projects are following a Scrapbook Sketch. 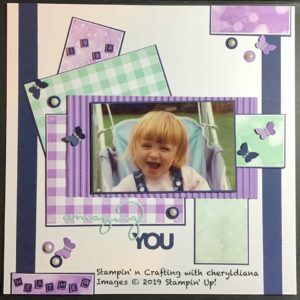 As many of you know I do love scrapbooking and sometimes when you are stuck for an idea following a layout can be very useful. Here is the scrapbook layout that we have been given. I started this layout by finding a photo that I could use. This is my daughter when she was 2 years old. I decided to use the colours from her stroller. Highland Heather and Pool Party where the nearest Stampin’ Up! colours. As I wanted different backgrounds I used Buffalo Check and Bokeh Dots stamp sets using Highland Heather and Pool Party ink pads. For texture I used the Corrugated Dynamic Textured Impressions Embossing Folder. These were mounted onto Night of Navy card stock to give depth. I decided that I wanted to make my own embellishments by punching the small butterflies from the Butterfly Duo punch and circles from the 1/2″ punch. I stuck pearls along the body of the butterflies and I found some retired SU pearls for the circles. For the subtitle and date I stamped letters and numbers using Night of Navy ink pad from Labeler Alphabet stamp set, cut them out by hand and mounted them onto the page using mini stampin dimensionals. For the title I used the Celebrate You thinlits. I hope you have enjoyed seeing my scrapbook layout. Please enjoy hopping around this blog hop and see how we have designed our pages using the same layout. Your layout is such a great color combo and she is adorable! That day is perfect for the layout. What a sweet photo too! Sweet layout! And what a cute subject!! LOVE the gingham! Look at all that gorgeous gingham! Your Page is exploding with sweetness! Very Very CUTE layout, love the colour palette you have chosen. Thank you Cheryl for joining us on the Jan Sketch Blog Hop.